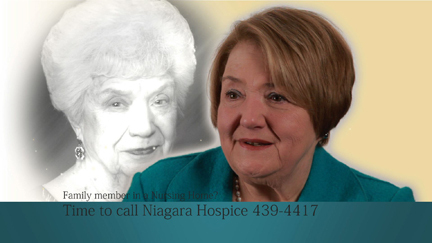 Niagara Hospice services are a Medicare covered benefit available to seriously ill residents of nursing homes, adult homes and in the community. The goal of the service is to bring comfort to residents - and peace of mind to their families. In addition to the individualized care received from the nursing or adult home facility, Niagara Hospice complements that care by providing hospice resources and services to the residents and families receiving our care. Each resident in the hospice program has an individual plan of care, coordinated with the facility staff, developed to meet the resident's physical, spiritual, and psychosocial needs as well as maximize their quality of life. "Niagara Hospice has given our family great peace of mind - knowing that mom has more visits from more people is very comforting." With hospice care, a resident and their family have the benefit of more visits from health care professionals such as nurses, social workers, spiritual care coordinators, massage therapists and hospice aides as well as pharmacists who work with the resident's physician to ensure comfort. Hospice volunteers provide the resident with additional companionship and services including pet visits, reading, vigil support and Legacy Recordings. "Our dad has enjoyed both pet and music visits. I truly believe they have helped him communicate more when we are able to visit." "The grief support we received from Niagara Hospice after mom passed was amazing. The counselors there really helped our son cope with losing his grandma." Hospice care within a nursing facility is not a substitute to the facility's care, but brings extra hands and hospice expertise to the resident and their loved ones. We provide specialized care for the terminally ill to allow nursing facilities to focus on their specialties, which include rehabilitation and geriatrics. Our staff and volunteers bring additional help to the facility staff, the patient and the patient's family. As a resident's needs change, our hospice staff will adjust their services and visits accordingly, regularly communicating with the facility staff. When needed the most, residents and families find support though our Vigil Team Volunteers who provide a comforting presence to patients who are in their final hours of life. Families unable to be at their loved one's bedside take comfort in knowing they are not alone. Care begins with a single phone call and referral from anybody - the resident's physician, a nursing facility or adult home staff member, hospital staff member, a family member or friend. Call 716-439-4417 for a free consultation or for more information to see if hospice is the right choice for your loved one.